Postal flights were introduced in 1956 and hand stamps with index numbers 2001, 2002, 2005, 2006, 2011 and 2012 issued for use on postal documentation associated with these workings. 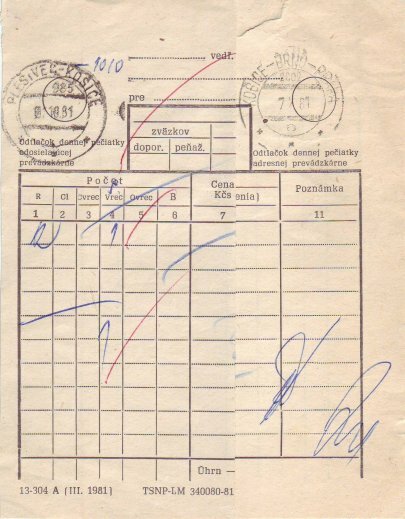 Bag manifest or "KARTA form" from HPO No 1010 (ex TPO 985) for the transfer of mail to the Košice - Brno - Praha Postal Flight (No 2002). In 1981 the Plešivec - Košice TPO No 985 was terminated and replaced by postal bus HPO No 1010 (Murán - Rožnava - Košice). For some time the 985 handstamp remained in use with manuscript "1010" written beside it. Document folded to show both handstamps. 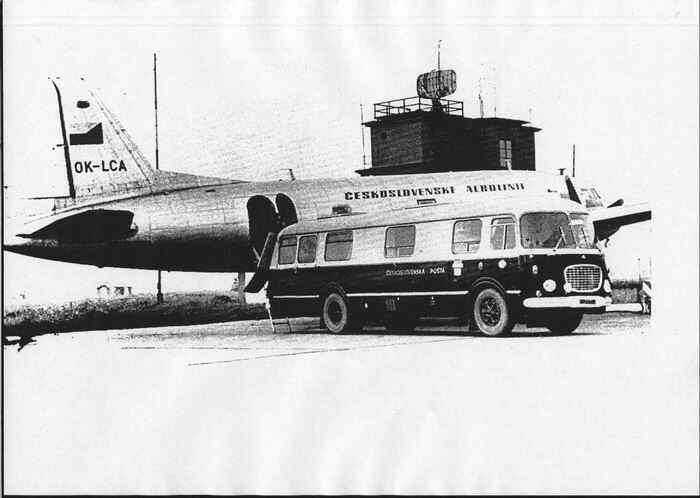 The photo, circa 1975, shows mail probably from HPO No 1181 (Košice - Michalovce - Sebrance) being loaded on to delayed flight Košice - Brno - Prague No 2002 (aircraft type Avia Av-14) at an airport in Košice. The mail bus is coach type Škoda 706 RTO. The sorting of letters and express packages in flight, using modified aircraft, started operation in Czechoslovakia in 1956 on six routes between Prague, Brno, Ostrava, Přerov, Bratislava, Zvolen and Košice, and ceased in 1982. In contrast, trial operation of in-flight post offices lasted only a few days in the US in October 1946. 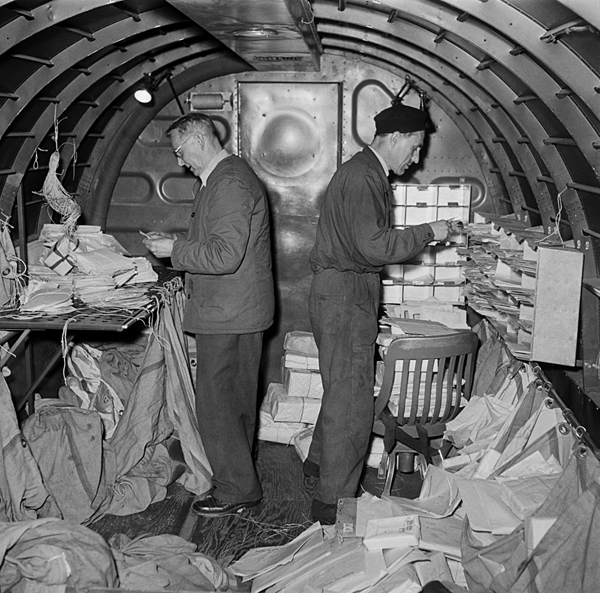 Postal clerks on board a Douglas C-47 "Dakota" Aircraft Post Office No 2006 (Praha - Přerov - Zvolen) in 1957.